The editor doesn't have a lot of frills, so you aren't going to be making a highly detailed map for player's use, but I can totally see using ANAmap to "knockout" a quick map. The interface is well labeled and quite easy to use and I was surprised at the functionality. 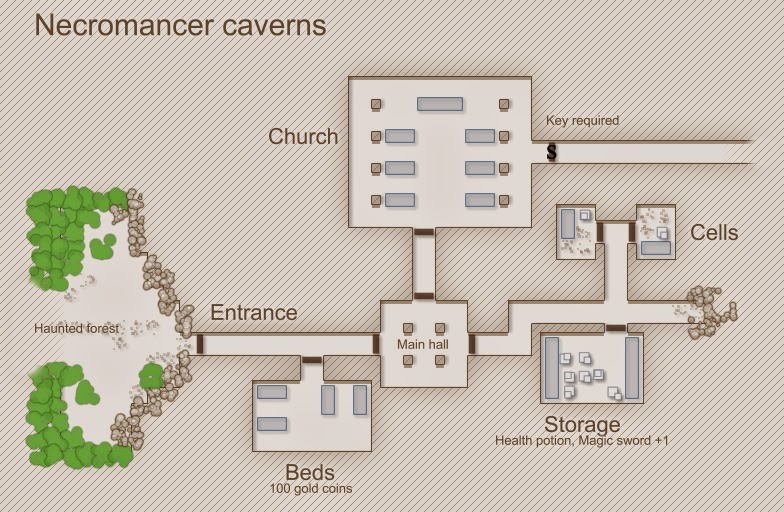 When I opened up the "example" map I didn't realize it was an actual editable map and started erasing stuff. Without even thinking about it I instinctively used Ctrl+Z and it undid my handiwork. That functionality isn't even listed. 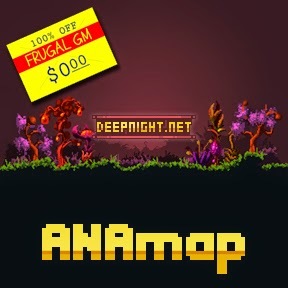 ANAmap was so quick and easy to use I'm planning on using it for my go-to GM maps. Nicer than a pen & pencil sketch, well at least my pen & pencil sketches, and faster than using most other programs. When you are "done" you can just export the map as a PNG file and manipulate it as needed. I loved the way the program provides variation for vegetation and the debris. This map probably took just a couple of minutes to make. It looks like ANAmap has been around for a year or so. I highly recommend taking it for a test spin.